Water levels for the trip were sitting at around 7.2 m according to the "BLACK RIVER NEAR WASHAGO (02EC002)" gauge on the Environment Canada real-time river data website. According to "What's Running" on BoatWerks.net, this translates to less than 6.8 cms. 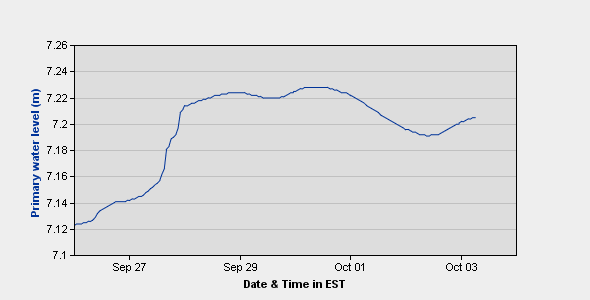 The graph below shows the water level from the days we were on the water. I'd say that you wouldn't want to run the river when it's too much lower than 7.2, as we had some low sandy spots that required wading. With even a bit more water, these areas would likely be open to paddle. However, it was still quite doable at this level if you don't mind getting your feet wet. I tied the canoe on the car at work at 4:30 and drove home. Had supper, then finished packing. Left for Mark's house at approximately 7pm. Arrived there at ten to eight. Mark had just got home from work. We packed everything into the green canoe pack and the barrel, then sat and talked for a bit and watched TV. We went to bed at 11ish. Up at 7ish, then breakfast of sausage and eggs. Packed the cars and took off. I followed Mark to the Hwy 169 bridge where we parked his car. Loaded Gordie into my car, and started driving to Victoria Falls. It took about 1 hr to drive to Victoria Falls, where there is plenty of room to park several cars. We walked down the trail a bit to check it out, then portaged the gear and canoe down below the falls/rapids. Very shortly, we came to "Longford's Lament," a chute with a nice rock at the end. I thought we could run in no problem, but we ended up hitting the big rock head-on pretty hard! Fortunately, no damage was done. Note here the large iron pegs in the rocks from the logging days. We assumed they were bent over by the ice and logs running into them in the spring flood. After the rapids, we stopped by the left shore to look at the bank. Gordie decided to jump to shore, but wasn't able to get a hold of anything (it was steep rock!) so he slid backwards into the water. We had to get him to swim to the opposite shore to get him on land and then back in the boat. Shortly after this, we came to a 1 m falls that we portaged on RR. Next up was Ragged Rapids, a long set of rapids/falls that must be portaged. After getting up the steep bank, there's a nice clear area with an outhouse. There's also a guest book to sign. Obviously this is private property, and the owners are nice enough to maintain the trail and facilities (thanks!) The portage follows an ATV trail/road, with signs at the first two turns marking the portage. The final turn (to the left) is not marked, but is obvious, as you hear the sound of the rapids. We hopped on the rocks out to the middle of the river to get a better view of the rapids-very nice! There is also a nice lookout along the trail that gives a good view of the falls. From Ragged Rapids to Big Eddy, the river is slow and twisty. In several places, the river was too shallow to get through, so we ended up wading. In these areas, the river bottom is a coarse sand, and the deep channel is hard to see until it's took late (a result of the very black water). There are also two sections where there are trees blocking the river, necessitating lift-overs. These downed trees seem to come in bunches-presumably because the open swamp along the shore in those areas allows for more fetch for the wind. Part way along, we stopped for lunch at a low beach on RR. Bagels, salami and cheese, apples, granola bars and GORP. At one point (UTM17N, NAD83, 649119E, 4962701N) there is a crazy "homemade" suspension bridge across the river. It's in disrepair, but may (?) have been used for ATVs or snowmobiles at one point. Regardless, it's a neat piece of engineering. At ~3pm, we arrived at Big Eddy. A Garden Gnome greeted us from a log as we pulled ashore. Here, the river splits around an island, with falls on both sides. The portage runs across the middle of the island, although the best access is blocked with a large pile of logs. We moved the gear across, and started setting up camp on the nice site on the end of the island. It's a sandy site, with lots of driftwood for a campfire. We put up the tent and tarp, and boiled some water for dinner of freeze dried spaghetti, bagels, apples, and granola bars. We gathered some wood and sat around a nice fire, before heading to bed after the fire burned down. Up reasonably early. Breakfast of granola bars, apples and GORP. Packed and on the water fairly quickly. Very shortly, the river turns south, and both banks are high, steep "levees" with buttonbush thicket swamp (extensive, especially on the west side) behind. At the road bridge, there is a set of rapids. We chose to line/wade down, although in retrospect it would have been easier to portage-problem is, RL is very steep, and RR is signed "No Trespassing." My boat got a few more scrapes as we hoisted it over some rocks! Cottages start to appear soon, and the river becomes rocky again (one huge outcrop is seen shortly after the Head River.) At one point, we came to a swift/rapid that was too shallow/rocky to run, so we lined the boat down. After passing a few more cottages, the Hwy 169 bridge appears. We took out on the downstream side of the bridge on RL at approximately 2:30pm. After loading the car, we headed back to Mark's place, where we unloaded the gear, then set off for Victoria Falls to pick up my car. Once there, we took a drive to the gates at Longford to check them out, then picked up my car. An hour later, we were back at Mark's. Amanda was home, so we chatted about her race while loading the gear in my car. After saying goodbye, I drove back to Barrie. Overall, a short (took us less than 10 hours of paddling), easy, convenient trip. You could also start at Cooper's Falls, or Big Eddy (if parking is available(?) and thus do the river in sections as well.